Today I had lunch at one of the best Mediterranean/Greek/Middle Eastern restaurants that I can recall - ever. 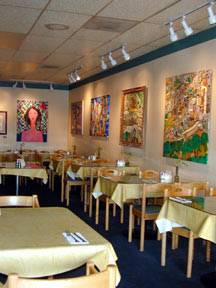 I'm talking about Fairouz Cafe And Gallery in San Diego (Gallery because the owner is quite an accomplished artist - Ibrahim Al Nashashibi - and loads of his work decorates the restaurant). The lunch buffet was amazing! It has both a vegan side and also a "regular" fare of Middle Eastern/Mediterranean delicacies - but many of them (I talked to the owner) come from Nashashibi's mother's recipes - which have been in the family for centuries. And I mean centuries - for example Nashashibi was born in a house on Jerusalem's Via Dolorosa which the Nashashibi family has owned for centuries! "You must try the Lemon and Chicken soup!" he begged me as I was about to leave. "It has been voted San Diego's best soup for the last two years in a row!" he told me. I tried it and it was delicious. As was the saffron chicken, which also tasted as it had been infused with lemon. The combo of saffron and lemon was a fantasy to the taste buds. Even simple dishes, like the garlic cabbage were amazing. And all of that and much, much more in a buffet for $8.99 - simply a spectacular deal for the money for home cooked food from the east part of the Med. The Washington Glass School has an immediate opening for a Studio Coordinator in its Mt. Rainier location. Founded 8 years ago, this is one of the busiest studios on the East coast. They are not only an educational venue, but they are also the home of many successful independent artists. The School also works with large scale public art projects. ~ Assisting or taking over some classes. ~ The ability to see how a very successful sculpture studio operates. ~ Many gallery and show opportunities. This is a great opportunity for someone who would like to further their sculpture or glass career, and to join one of the most successful teams in the region. Please email Tim Tate at TimTateGlass@aol.com.